Teary-eyed bride, Carmina Villaroel as she knew the secret wedding planned by Zoren Legaspi held at Fernbrook Gardens Las Piñas last November 15, 2012. The fairy-tale like wedding draws big attention of netizens and televiewers as ABS-CBN airs the wed documentary Saturday November 24. “I was really clueless, that’s why when Zoren proposed to me under a cherry blossoms tree that he had made as part of the surprise, I couldn’t hold back my tears,” Carmina said on press. Carmina thought that it's a photoshoot of a family-oriented commercial for Selecta, the brand they are endorsing. She had a weird reactions at first that somehing is wrong, it is some kind of big "something" is happening. Legaspi's twins Mavy and Cassy were also in connivance for the secret mission. Mavy, with the blood of an artist in real life situation became "best child actor" to pretend that he did not like the moves the choreographer insisted for the photoshoot which got attention of Zoren and even fight to the choreographer. The much talk- about wedding trended on Twitter Philippines and worldwide. 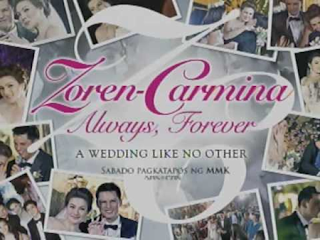 Nationwide viewers now seen how different the surprise wedding is and how Zoren is passionate and loves Carmina. Netizens said that the groom leveled-up the standards of women and dream of the same wedding like no other, Carmina had experienced. It was a civil wedding officiated by Court of Appeals Justice Amy Javier. Video below is the coverage as they make vows in front of the judge.